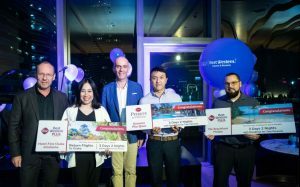 Bangkok (Thailand) – March 28, 2019 (travelindex) – Best Western Hotels & Resorts has said a huge “thank you” to its partners and associates in Asia by hosting a glittering party in Bangkok. The “Best Western Thank You Party 2019” was held at Cocoona Lounge, on the 19th floor of the Gaysorn Urban Resort in Bangkok on Thursday 21st March 2019. The event gathered approximately 70 of the company’s closest partners, including travel agents, corporate clients, marketing partners and members of the media, for a fun-filled evening of networking, live music, fine food, and cool drinks. A prize draw was also held during the night, with fantastic prizes including stays at Best Western branded hotels and resorts across Asia. Ms. Piyada Jakkham of Krungthai Card PLC. (KTC) was the lucky winner of the first prize – a two-night stay at Best Western Plus Hotel Fino Osaka Kitahama, Japan, including daily breakfast for two guests and a pair of return flights between Bangkok and Osaka! Mr. Kevin Ng of Travel Weekly Asia won the second prize, a two-night stay at Best Western Premier Sonasea Phu Quoc, Vietnam, including breakfast for two; while Mr. Evan Crosby of Travco was the lucky winner of the third prize, a two-night stay at Best Western Plus The Beachfront Phuket, Thailand, inclusive of breakfast for two. Finally, Mr. Patchrakorn Parnthong of HotelBeds won a Travel Card worth US$100, which can be redeemed at any Best Western branded hotel worldwide. “This event was our way of saying ‘thank you’ – a small gesture of our appreciation for the amazing hard work and dedication of all of our partners. We look forward to building even stronger and deeper relationships with our partners in the future,” Olivier added. The Best Western Thank You Party 2019 also allowed the company to update its guests on Best Western’s latest news and exciting developments. This included the recent acquisition of WorldHotels®, the renowned global collection of approximately 300 luxury hotels and resorts. As a result of this acquisition, Best Western now operates 16 distinct hotel brands in all sectors of the market, from economy to luxury. Moving forward, Best Western will continue to develop its portfolio of hotels and resorts across Asia, whilst working with its trade, corporate, marketing and media partners to create world-class guest experiences for the benefit of the entire industry. Best Western Hotels & Resorts headquartered in Phoenix, Arizona, is a privately held hotel brand with a global network of over 4,500 hotels in nearly 100 countries and territories worldwide*. Best Western offers 16 hotel brands to suit the needs of developers and guests in every market. Best Western branded hotels include Best Western®, Best Western Plus®, Best Western Premier®, Executive Residency by Best Western®, Vīb®, GLō®, AidenSM, SadieSM, BW Premier Collection®, and BW Signature Collection®. Through recent acquisition, Best Western now also offers WorldHotels® Luxury, WorldHotels Elite and WorldHotels Distinctive brands. Completing its portfolio, Best Western offers SureStay®, SureStay Plus®, and SureStay Collection® franchises**. Now celebrating more than 70 years of hospitality, Best Western provides its hoteliers with global operational, sales and marketing support, and award-winning online and mobile booking capabilities. Best Western continues to set industry records regarding awards and accolades, including 66 percent of the brand’s North American hotels earning a TripAdvisor® Certificate of Excellence award in 2018, Business Travel News® ranking Best Western Plus and Best Western number one in upper-midscale and midscale hotel brands respectively for two consecutive years, and Fast Company honoring Best Western Hotels & Resorts with a spot in the Top 10 Most Innovative Companies in the Augmented Reality/Virtual Reality category. Best Western has also won 10 consecutive AAA®/CAA® Lodging Partner of the Year awards, recognizing the brand’s commitment to providing exceptional service and great value to AAA/CAA’s nearly 60 million members in the U.S. and Canada. Best Western-branded hotels were top ranked in breakfast (food and beverage category) by J.D. Power’s 2018 North America Hotel Guest Satisfaction Index Study – ranking first for midscale; and second for upper midscale. Nearly 40 million travelers are members of the brand’s award-winning loyalty program Best Western Rewards®, one of the few programs in which members earn points that never expire and can be redeemed at any Best Western-branded hotel worldwide. Best Western’s partnerships with AAA/CAA and Google® Street View provide travelers with exciting ways to interact with the brand. Through its partnership with Google Street View, Best Western is the first major company of its size and scale to launch a virtual reality experience for customers, setting a new industry standard and reinventing how guests view hotels. **All Best Western, WorldHotels and SureStay branded hotels are independently owned and operated.